6:31AM - Baby alarm... ugh, I'm up. 6:35AM - Oh good, it's *only* 80.3F outside right now. That means it'll only be like 115F in the garage/driveway this afternoon. 6:42AM - What is it about Cheerios that babies find so delicious? I wish I loved Cheerios like babies do. 7:23AM - After fighting with the stir bar and my stir plate for an entire day, it decides to start cooperating this morning. Maybe this is a sign of a good day. Anyway, the yeast should be in a happy place by this evening's pitching. 9:19AM - Cleaning situation wasn't bad... just going to need to rinse and run hot water through everything to be safe. I've got the B3 1550 out and ready to get things going. Temperature update: Garage = 99F, official OAT (from nearby elementary weather station) = 83F. 9:56AM - Found a problem with the pump during cleaning/testing of the brewstand... if there wasn't an "oh bleep" moment during brew day, then it wouldn't be a real brew day. 9:58AM - Halloweenhead by Ryan Adams... jam. 10:20AM - ...but Int'l Players Anthem by UGK... infinitely more jammerific. 10:33AM - I just killed a 2+ inch roach in the garage with Raid. I hate those things, but when they get sprayed, it is kinda sad. They slow down and start twitching. I don't think I could ever be a game hunter... or a gangbanger. 11:04AM - Got everything hooked up and ready to go. 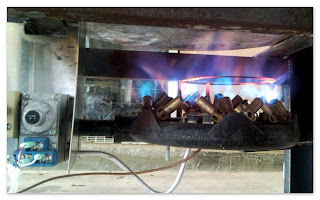 Heating the Hot Liquor Tank (HLT) water. 12+ gallons from ~80F to 165F is going to take a while. I think I've lost several gallons of water through the sweat pores already. 11:15AM - Adjusted water chemistry to the recommended 5.2pH using 5.2pH Stabilizer. It's a powder you just dump in the water, and pow! 5.2pH. Scary. 11:18AM - And there I was... typing about pH and jamming to Timberlake when it occurred to me: It's kinda quiet. The burners had turned off... gas ran out. Backup propane is now on duty. 11:58AM - Mashed in 29lbs of delicious malts. I bet you are wishing you had smell-o-net right now. Aroma is heavenly. Timer is set. Mash time is 1 hour. 12:18PM - Meanwhile, inside the house, apparently my baby girl found some super glue and got it all over her hands and feet. Sweet. 12:22PM - All of baby girl's appendages and digits are unstuck from themselves. Odds are pretty good that won't be the first time she glues herself together with super glue. Mash nearly half done. 12:33PM - Getting a late start with the drinking. Starting with an Abita Harvest Wit. It is a middle of the road Wit, but tasty and accessible enough to hit the proverbial spot in this 94F (100F heat index) weather. 1:01PM - Mash done. 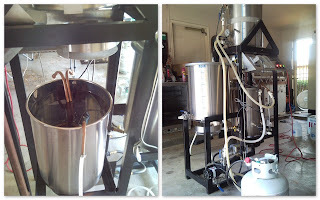 Raising the mash temperature to 168F before sparging (helps with efficiency). 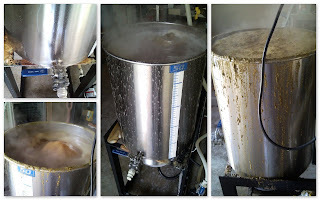 Once there, I'll start the slow rinsing of the sweet wort from the grain and collect it in the brew kettle. 1:08PM - Beer #2: Harpoon UFO. 1:34PM - Arg! Broke a rubber o-ring on mash tun valve. Sweet wort leaking on the ground! After a mad scramble around the garage, I found some replacements I had the foresight to purchase in advance (well, to be honest, I had an o-ring problem during a previous brew session with no backups... but after that I was smart enough to keep backups in the brew supply box). 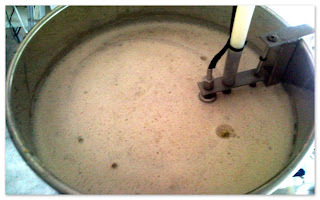 1:49PM - Here is the scoop on the sparging: This is an 11 gallon batch (split into 2 5.5gal batches). Boiling and equipment losses should a little over 2 gallons. My plan is to collect just over 13 gallons in the kettle before starting the boil. This should take another 45 minutes. 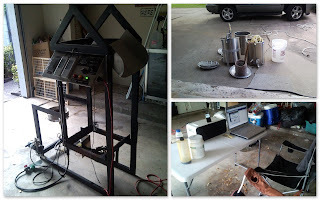 Here is the scoop on the temperature: OAT = 97F, Heat index = 101F, Garage Temperature = Nearly boiling. Cold War Kids - Hang Me Out to Dry... just reading the words "cold" and "dry" off the iPod makes me happy. 1:59PM - Beer #3: Victory Prima Pils. If you don't know, you better axe somebody. 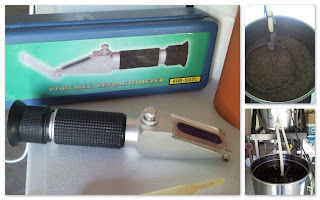 3:04PM - Took a specific gravity reading with my refractometer "toy." I missed my targets a bit (73% efficiency vs the target 75% efficiency, not bad!). No worries. Dumped 4.5 oz of some light dried malt a bought for just such an occasion. Chances of boil over: Is there something more than 100%? 3:23PM - Boil started... 60 minutes on the clock. 6 oz of Galena hops added to wort. 3:25PM - Smart money was on the boil over. 3:49PM - Beer #4: Victory Prima Pils again. Don't question me. 3:52PM - 2oz Cascade hops added. Wort revolts and threatens boil over. I threaten to turn off the heat and we agree to continue. 4:04PM - I just had a mini Butterfinger from one of the kids' Lunchables. It may have been more than a decade since I've had a Butterfinger. I forgot how much they stick to your teeth! I have what feels like a mouthgaurd of peanut butter flavored sugar on the tops of all my teeth now. 4:09PM - 2oz Liberty hops added. This time, my disapproving stare keeps the wort and it's boil overs in check. 4:17PM - Tossed a Whirlfloc tablet in there. It is supposed to clear the wort (coagulates wort proteins). Boil almost over. 4:20PM - OPP. I was very pop culture "aware" in the early 90s. I was in high school in the early 90s. I'm pretty sure that before that time, during, and since that time there is pretty much only 1 other meaning, other than the literal meaning for Treach's ad lib opening to the song. No, not the command to "harm me with harmony" (whatever that means). It's what he asks his homie to do to us listeners. "Dave drop a load on 'em." 4:46PM - Pumping the wort into 2 carboys for primary fermentation. 5:10PM - Time for some cleanup outside... ugh. 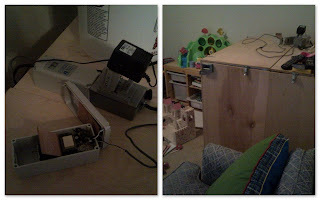 The carboys have been put away in the fermentation box... located in what used to be my office, but is now the kids' playroom. I figured I could give up my office if they could deal with me having a 4'x4' corner for my brewing supplies. The temperature is still too hot for me to pitch the yeast. Post boil cooling is a problem I really need to solve. Update (the next day) - I wanted to pitch the yeast with the beer in the mid 60's... at 2:30AM, I convinced myself that 72F was just fine. 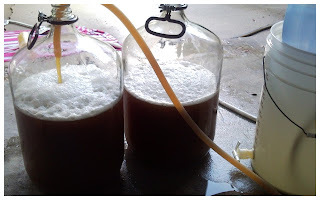 1500mL of a 1.040 strength yeast starter (prepared Thursday evening) went into each carboy. This beer should be about 8% ABV. The two guys are being stored at 68F where I'll let the yeast do their work for about 10-14 days. Once fermentation has nearly finished, I'll transfer them on top of some additional hops and some American oak cubes (simulating "barrel aging"). One 5 gallon batch will get wine soaked oak chips and the other will get whiskey soaked oak chips. I'll update this post again if anything exciting happens. Awesome update. Great brewing weather, maybe you should consider updating the "EPFS" during the day. "Estimated pounds of fluid sweated"
From baby alarm to garage cleanup. Well done SirRon. The work schedule dictated the drinking schedule a bit. I did have a bottle of juice, 4 waters, and 4 beers while outside. That ain't too bad. I finally bailed on Houston and went to our place int he Hill Country. If I have to be hot adn don't have to be in the humidity. RH was 20 percent here yesterday. I thought that you might like (appreciate) this recent Iron Drink dining event that pitted beer and wine in a glass-to-glass competition in Austin. I read your blog from time to time. Thanks for stopping by and dropping a note. As an practicing cross drinker, I would have loved to attend an event like this. Being competitive I have a proclivity towards events like this, especially since it includes two of my other affections: food and drink. Coincidentally, I credit the Texas Culinary Academy for introducing me to the joys of pairing beer and food... not just having them at the same time. My first encounter was when I attended their presentation at the Texas Craft Brewers Festival in 2004.